Has the time come to realize that MAYBE this team is not as good as the typical January and February hype portrayed? Using this logic of spring-training batting averages, the best hitters in the National League are . . . I'm not saying there should not be some concerns about the Cardinals' offense. Ozuna, for example, has me concerned. I think he's the biggest catalyst or anchor on this team, offensively, depending which way his power (or lack of it) leads. It's worth remembering the team is also getting used to a new hitting coach, and working on hitting more than taking walks. We should see more regular-season-like at-bats as the regular season nears. I'm not hitting the panic button yet. They still have to make a 40-man move for the backup catcher. Do you think Cecil or Gregerson will go on 60-day IL? I think both will, and have said as much for a while now. So now we’re applauding Fowler for backing up throws? Yep he’s finally doing things you learn in little league, let’s give him a pat on the back. I don't know what to do here, guys. You ask me what I see, and what looks different, and I tell you. Then this happens. If Fowler stinks again this season, the Cardinals can't trot him out there every game. They don't think he's going to stink, and I'm giving you reasons why beyond his batting stats after a very small sample size of 36 spring at-bats. I didn't say pat him on the back. I said, here are some things that look different from the guy who was playing beneath a cloud last season. Do you think the Phillies signing Harper might have convinced Trout to stay in LA, with the idea that Harper took his hometown spot? Think the Phillies will regret it? If anything, I would guess it worked the opposite way. Harper going to Philly and openly campaigning for Trout to join him likely increased pressure on the Angels to get the extension completed. Trout talked to Harper about Philly and why he should go there, Harper has revealed since he signed. If I'm Trout, the notion of playing with Harper makes free agency more, not less, appealing. Now he will never get there. Fans: I just love his grit and the way he plays the game. Fans: We should really applaud him for doing something you learn in little league? That's the biggest thing I've noticed with Fowler. People see what they want to see. It's why it's going to be so hard to set a fair expectation for him 2019. If he has his career-average season, he bounced back (to some). If he has his career-average season, he got better but is still not that good (to some). I thought reports made it seem like Gregerson wasn't that far from being ready to pitch? Can a player reject a 60-day IL if they feel they'll be ready sooner than that? Late last week, pitching coach Mike Maddux said Gregerson is on a "slow track back" and that he was "not over the hump yet." Camp's rounding the corner for home. Gregerson has not yet pitched in a Grapefruit League game. What am I missing? I feel your pain. Some of these people just absolutely refuse to see ANYTHING positive about Fowler. It's going to be so satisfying when he comes out and has a terrific season, although the haters will still hate on him because he wasn't Mike Trout. I would just ask for some common sense. The Cardinals did not keep Fowler's contract around this long to eat the remainder of it when they feel like he has had some good signs this spring. If they were looking for reasons to pay him to go away, they would have done it by now. They feel like he's in a good place. He feels like he's in a good place. There are signs that suggest as much. Now, if he goes out there and does not perform, then immediately pressure is going to start building to play Tyler O'Neill and/or Jose Martinez. The best question is how much time does Fowler get to produce when games count. The Cardinals hope they don't have to find out. I’ve seen my share of spring training games both in Ariz and Fla. I have yet to see a pre-season game that even closely resembles a regular major league game given lineups sprinkled with minor league players, game strategies with pitchers experimenting in mechanics, field and windy weather conditions that are oppressive to hitting especially in Fla, etc, etc. Am I the only one not concerned about the Cards weak hitting in Fla? I know everyone is focusing on if Fowler sets a minimum amount of performance in order to justify him being the RF starter, but at what point does O'Neill's outstanding play trump whatever Fowler may or may not be doing and he wins the RF job? I mean, I do not understand how one mistake (a $80 million contract that is wasted) would be compounded by another one, not starting a better player in the lineup? They should the GM accountable for signing the bad contract in the first place, not justifying it by putting a lesser product on the field. At the point that Tyler O'Neill's play is so outstanding. I'd argue that Jose Martinez would have a better case to start above Fowler than O'Neill. And no, I'm not an O'Neill hater. But he's going to get plenty of chances as it sits now. He's the backup center fielder. He can also make starts in right and left. This idea that he's wasting away is one I don't understand. The Cardinals have made room for him on the opening-day roster. They are going to get him at-bats in pinch-hit opportunities. He has five spring home runs, yes. He also has 15 strikeouts in 47 at-bats and a .191 average. People are complaining about Fowler's average this spring, but praising O'Neill's "outstanding play", when he's hitting only .191 with 5 HRs and 15 Ks in 47 ABs. That's Rob Deer territory. I'll repeat my spring-training mantra. Spring training stats don't matter .. . unless they support the argument for a player you want to see get more playing time, or less. What do you think the best case scenario for the XFL is? Becoming an NFL development league? And if it was, would that kill St. Louis's enjoyment of the league? I think the Alliance league has already cornered that market, and it's handing out contracts that could try to interfere with the XFL's recruitment of players. The XFL might be better off becoming the anit-NFL, though that's an uphill battle, considering most players are going to hope to jump from whatever league they are currently in to the NFL. The difference might be going after guys a step or two out of the legaue on the back end as opposed to the guys who are trying to get in. Maybe that works. Bigger names. But the quality might not be as good. That's if, of course, the Alliance league sticks around. None of this seems all that cemented. Ok, start Jose Martinez then. My point is, $ is what makes the decisions, not who plays the best. That is disappointing. If I had one game to win today, I probably would. That said, if Fowler can get on base like he has every season before last season, it would be quite nice to have him for run-scoring purposes, right? The attention on Fowler's offense should shift from his average to his OBP. If he can get on base, this team will score runs as a result. Not every hitter has the same role. Fowler's, traditionally, has been table-setter, on-base percentage hoarder, run-scorer. The Cardinals think he can be that guy again, and maybe have some of that 2017 power. Sure, money plays into it. Money plays into everything. It plays into my job, your job, real life. Brett Cecil is not still here if he makes the league minimum. Track record also plays in, and Fowler has looked more like the guy who has a good track record than the guy he was last season. Why just eat the contracts of Cecil and Gregerson in Spring Training? Why not let them pitch and see if they can bring back their former success? If they can, great. If they can't, then I'm sure you'll see them "eat the contracts". But if it comes to the point where more productive pitchers are not pitching for a significant amount of time to try to salvage a contract, fans will and should see through it. I hope Fowler plays great because he plays for the Cardinals and I’m a Cardinals fan. I was simply suggesting that when we even have to bring up the fact that he’s backing up throws as a positive, and it’s someone that the Cardinals are paying 82 million, that’s probably not ideal. I brought it up because it's an example, just one, of a player who had a career-worst season being locked in and bought in on all aspects of the game. I'm not throwing a parade for it. The question was about how Fowler looks via eye test, so I tried to answer truthfully. Last season, he looked like he was playing with an anchor around his ankle. "Handcuffed," he told me earlier this spring. The cuffs are off. That was my point. Again, how he feels and backs up throws won't matter if he can't get on base when games count. 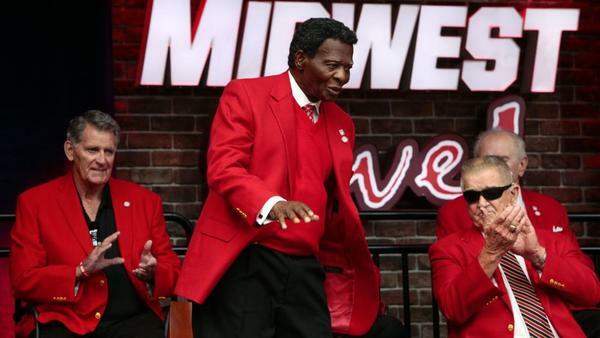 How is Lou Brock's health? I'm getting concerned that this might be the last time we see Lou at an Opening Day celebration (if he makes it this year). He's hanging in there. Rick Hummel had a great story about him this spring. I'll dig it up and link in here. He will be at opening day, if he's able. That prediction looks good today. I do. Certainly. Travis has done exactly what he said he was going to do, and that's easier said than done. He's turned SLU into a place that has a fighting chance to keep the region's best players home, and that's a big accomplishment when the region produces as much talent as this one. His teams have had to weather some storms, but they stick together, defend their tails off and have built a competitive home-court advantage. We should get a better idea this offseason if Ford sees SLU as his long-term home, or if he sees it as a stepping stone to get back to a Power 5 conference. My advice to him would be this: Make the program you have into the one you want. SLU is a sleeping force. Ford could become a very powerful and successful coach by anchoring in Midtown. I hope he does. That is the plan moving forward, with a few exceptions here and there. One of those exceptions could be Matt Carpenter's back. TBD on how serious that is. That's a significant question mark at the moment, though the team is downplaying concerns. Yes, it can be wise to panic when the team downplays injury concerns. Is it fair to question the rotation this year? On paper, it looks like potentially the greatest asset the Cardinals have, but I think it's fair to expect *some* regression from Mikolas, Waino's been questionable for years, Wacha has a JD Drew-level ability to get hurt, and logic would dictate some of the young arms are bound to get hurt or falter. I don't mean to be a pessimist, but it would certainly be comforting to at least have one or two sure things, whatever that looks like as a pitcher. Questioning the health of pitchers is always fair, though every pitcher's health can be questioned. This game can be played with every single team. The Cardinals' two sure things are Miles Mikolas and Jack Flaherty, and they should inspire as much confidence as any two starters around. Every rotation has what-ifs. These two don't have that many. Mikolas likely will have some regression from last season, and if he does that's still a very strong season. Dude went 18-4 with a 2.83 ERA and 200-plus innings pitched last season. I care more about the three strong seasons he posted in Japan more than I care about whatever numbers he put up in the majors before his reclamation overseas. And Flaherty? He was a legitimate NL ROY candidate who had 30 more strikeouts than the winner. He has been absolutely lights out this spring. Wacha pitches well when healthy. Nothing's changed there. If Wainwright had bad spring numbers, people would be freaking out .But he's had a strong spring, so he's being dismissed. So it goes. Dakota Hudson should have knocked John Gant out of the rotation with his last outing, so that means the rotation just got better. And then there's Carlos Martinez. A case can be made that the Cardinals had room to add an elite starter. Sign Keuchel if healthy, though I'm starting to wonder if teams think he is? Trade for Kluber. I like those arguments. But the depth is good, and deep, and history suggests the Cardinals always have talent-rich pitching prospects ready to pop from the pipeline. Whenever Ford or SLU has success the first comment always seems to be "well Ford is gone". How come it's never talked about that Dr. Chaiftez probably has a big call in that. He is paying 50k to send students to the tournament, seems like he is dedicated to keeping SLU a winning program and can give Ford a raise to keep him here. No, SLU doesn't have Texas money but don't think those big spenders go after Ford after 1 good run in A10 tournament. I just made the case that he should stay! Here's what you need to know about Ford. He is going to want to keep the pedal down. That's just how he works. If SLU (and Chaifetz) is determined to grow with him, then look out. Ultimately, it will come down to Travis, his desires, and his success. He can't jump when there is nowhere decent to jump to. If and when that opportunity presents itself, it will be up to SLU to show its commitment and support in order to keep him. Benfred how would you handicap mizzou's chances at a bowl ban reversal? Man, I hate to guess, and that's all it would be. I know Mizzou has thrown a pretty impressive legal team at it, and that there are people of significance within the NCAA that felt like the punishment did not fit the crime. Mizzou was told to expect vacated wins and probation. The other stuff came completely out of the blue? That's what is going to be discussed as the process moves forward. Forcing the NCAA to answer the question of why it dropped a hammer on a school that conducted its investigation and cooperation in a manner that was praised by the NCAA throughout the process is going to cause an interesting discussion. Will the NCAA say, you're right, we over-reached? Or will the NCAA double down? Mizzou's very public campaign and comments about concerns over the NCAA's shaky future might be ticking off some folks in Indianapolis. To wonder if that factors in is completely fair. In short, get your popcorn ready. Another thing: If Mizzou got to take one punishment off the table, I do think it would be the bowl ban in Kelly Bryant's lone season. Sorry if I've missed this but what is the timetable for Reyes' return to full action? He's going to be in the bullpen, unless there is some sort of a surprise. Do you think they're more determined to get something out of Shreve because of Voit's success with the Yankees? No. The focus is getting something out of Shreve. And his spring has suggested he has something to give. It's not like there are any other lefties beating him out for a spot at the moment. Does Cecil have a nerve issue as in he's getting on the front office's nerves? The entire situation is a mess that I think eventually ends in a parting of ways. Everything else is just semantics at this point. Will these big contracts to Harper, Machado and Trout quiet some of the labor tension and talks of a strike? Not to those who are paying attention to the details. The players are not complaining about young, in-their-prime players not getting paid enough in free agency or as free agency nears. Trout, Harper, Arenado, Machado are all about the same age. The players are concerned about good young players not making what the shifting business model says they are worth, and that's a wiser thing to be concerned about than older players not getting paid what the old business model said they were worth. One is a smart argument. The other is outdated. On that note, the players should be happy about owners seeming more willing than ever before to increase the pay of minor leaguers. That, to me, says more about things moving in a positive direction. However, Manfred sneaking the three-batter rule change past the players for 2020 did not seem to go over well with Tony Clark. Why Manfred is willing to risk damaged feelings over something so dumb is beyond me. These things tend to add up and then come out when it's time to sit at the table. Will playing 3B every day be too hard on Carp's body? In the past, they've used his injuries as a reason to keep him primarily at first base. Clearly that's not an option now. I think Carpenter's back tightness, an on-and-off-again thing, has more to do with his contortionist swings than his defense. The shoulder was the concern at third base, and that's looked better. The back is his Tiger Woods torque. He has gotten better about catching it early, and letting it calm down. In the past, he just pushed through and sometimes made it worse. If you made the lineup where would you hit Goldschmidt and from what you’ve seen do you he’s already becoming a leader on this team? Third or fourth, probably. And, yes. But he's not a cheerleader type. He leads by being a great player who tries to be great every single day. When he's out there taking grounders, practicing leads, talking shop, and someone who is not as talented -- everyone -- sees that, it makes everyone want to work a little harder. He's the kind of hitter who puts confidence in the clubhouse by putting on a jersey. His actions speak louder than his words. Ben, do you think the Blues have a team that can challenge for the cup? When they are on their game, they are nearly unbeatable. Well, I'm one of the dunce-cap-wearers that thought their season was toast, so what do I know? I think they are a playoff team now. I don't think they can win it all, but there have been moments during the turnaround where it looked like they could. Don't discredit that. Let's see how Tarasenko looks now that he's back. If he can get hot after some downtime, a deep run won't sound so crazy. Thanks for jumping in, everybody. Time to shift gears for some other work. Talk next week. I'll be back in The Lou.